Join us for bugs, science, photos, drinks, and fun! Tickets are just $10 for members, through Feb 25! 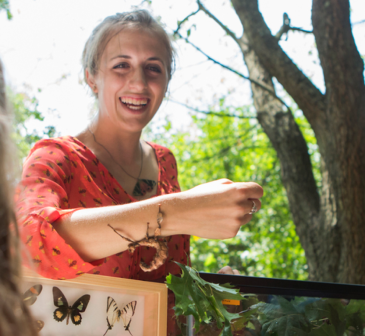 Join Isabelle (Isa) Betancourt – entomologist, photographer, and science communicator – for an interactive evening of bugs! Isa will share her work documenting insect biodiversity in Center City Philadelphia through collecting insects that get trapped in the iconic Swann Fountain. She’ll have lots of great photos to show and as a bonus, *you* can bring your own bug photos! Ask Isa about your bug pics – or bugs in general – or try to “stump the expert” with the weird and unusual bugs encountered during travels near or far! Before, during, and after, you’ll be able to enjoy drinks (cash bar) at Quig’s Pub, aka “The Actor’s Speakeasy”, the private club inside Plays and Players! Bugs, drinks, science, fun! Preview the evening through one of Isa’s weekly live-broadcasts (#bugscope) that shares the world of entomology with a global audience. We regret this venue is not accessible, and guests should expect to climb stairs. Isa Betancourt, an explorer at heart, knew at a young age that she wanted to be either an astronaut or an entomologist. Her mom was happy when she went the entomology route.